a bag of deceptive weights?" 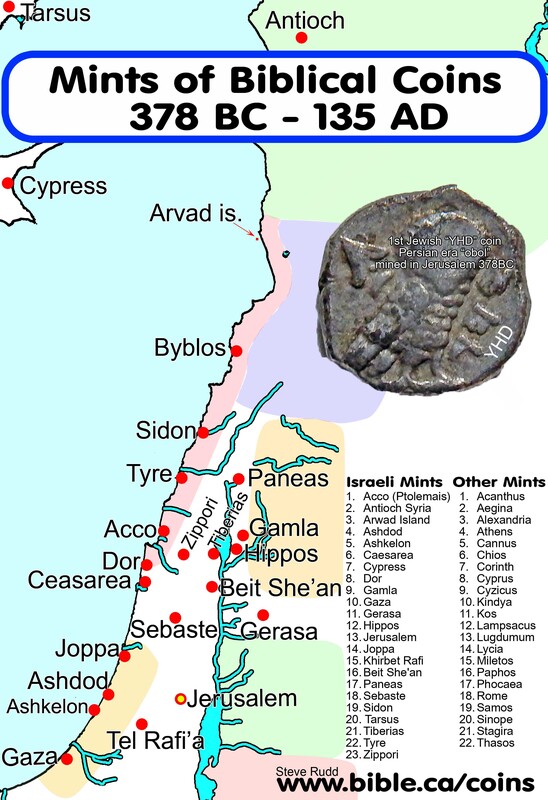 Chronology of Biblical coins: In order to understand coins used in Israel, it is helpful to become familiar with the statue vision of Daniel 2 because we have organized this presentation to correspond with these four kingdoms. Hasmonean era ruled by Jewish Maccabean family as recorded in the Apocrypha: 166-37BC. We live with coins and paper money but before about 600 BC, coins did not exist. Instead, a weight standard existed similar to the Gold Standard the world used up to the 20th century. 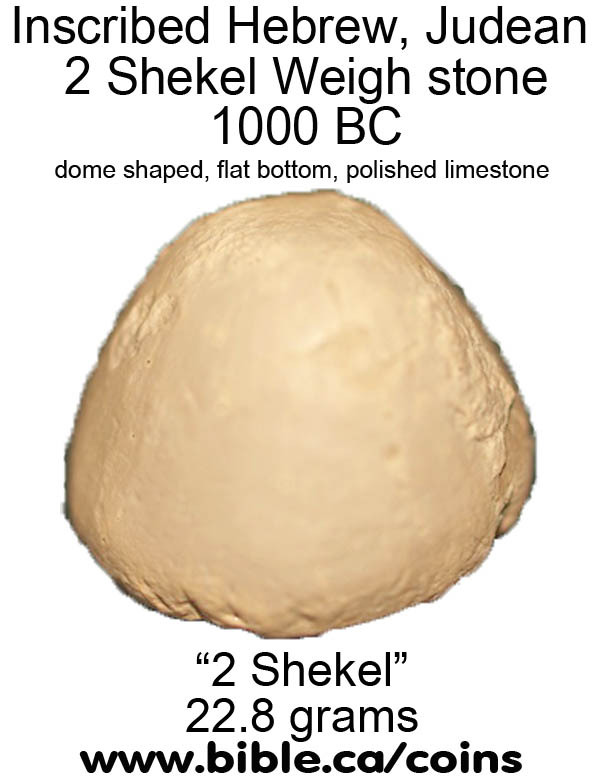 Most weigh stones during the Iron age (1100-587 BC) were smooth polish dome-shaped limestone with flat bottoms. 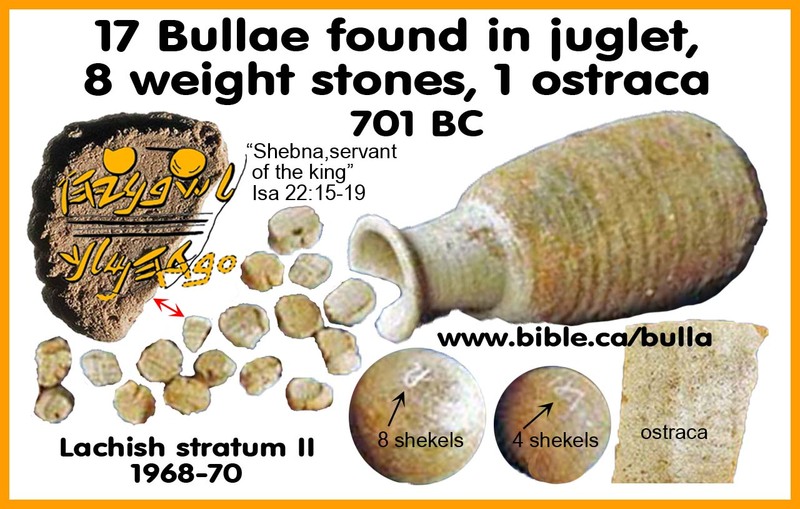 Eight Hebrew weight stones from 701 BC excavated in Lachish, stratum II: four stones were 8 shekels and the other four stones were 4 shekels along with 17 bullae including the famous Shebna bulla of Isa 22:15-19. Although coins were first used in Babylon and Athens at early at the 6th century BC, the first coins were used in Israel about 378 BC. However, Jewish coins would use sunbursts or other symbols in place of the image of the ruler as seen in the 2 Prutot of Alexander Jannaeus the widow put into the treasury at the temple. Coins were made by pouring molten metal into "flan molds". When cool, each blank flan would be punched in a set of metal dies that had the image on the obverse (front, heads) and reverse (back, tails) sides of the coin. Some coins were poured in "straps" and would have be cut apart from each other before use. Counterfeit coins did exist but unlike today, they were accepted and circulated as long as they were believed to be gold, silver or bronze AND had a specific weight equal to the official coin. Just like the gold rush days, the value was tied to the weight of the metal, not some government assurance through an official mint. Currencies other than metals include livestock, land. Human slaves were valued at 20-30 shekels of silver. 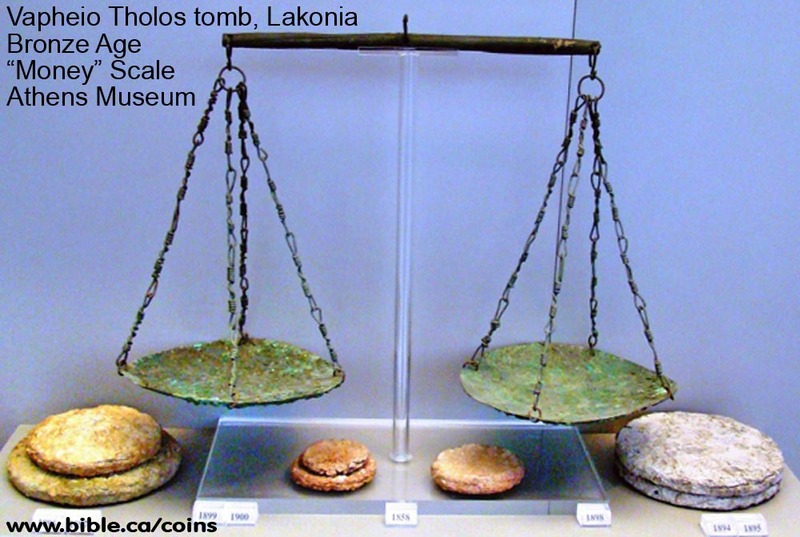 Before coins (600 BC) everything was measured by weight or volume. Today 6 shekel coins in Israel will buy you a coffee. 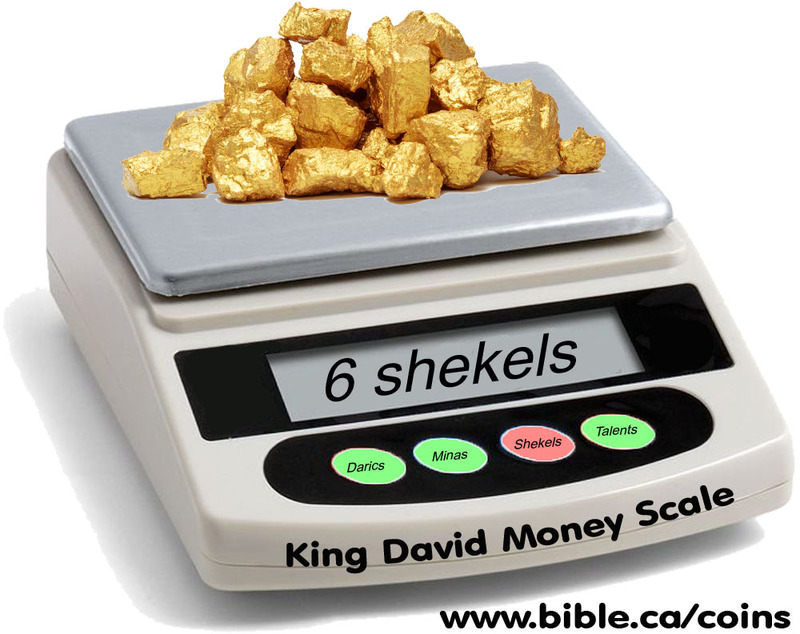 In ancient times 6 shekels was a specific weight and the value was dependent upon what was being weighed in the scale! Weight stones were a standard weight system place in one side of the balance. The earliest money system was based upon specific price of the weight of metals and commodities. Today, we do not use the weight system: It is quite convenient to carry tiny coins and bills in your pocket equal to the "monetary value" of 200 kilograms of metal. However, governments have huge stockpiles of gold in places like Fort Knox in reserve that back up the otherwise worthless paper currency. On June 5, 1933, Franklin Roosevelt took the USA off of the "Gold Standard", where coins and paper money currency had to be backed by and equal value of gold in Fort Knox and other repositories. A talent a shekel and was a specified weight of a precious metal which was understood to have a specific "monetary value". 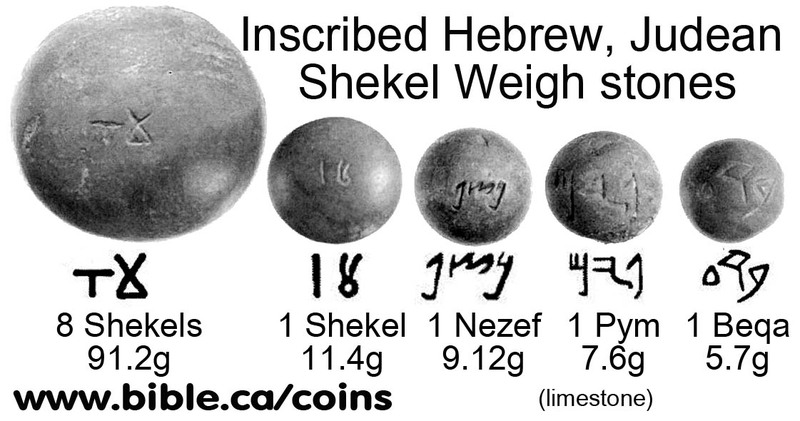 Before coins, Third/fourth of a shekel is not a coin but a fraction of a known and accepted weight of a shekel: 1 Sam 9:8; Ne 10:32. Remember that coins were not used in Israel until after 400 BC. Later, for convenience, a coin was struck with various symbols on it, to standardize the "value" of the corresponding weight of the gold, silver or bronze metal. Coins allowed a quick exchange of trusted value without the need for scales. This meant that coins could be traded quickly without the need to weigh each one because the "minted" weight could be trusted. The question is this: If Israel continued to use a money value tied directly to the weight of the gold, silver or bronze, why use coins? The answer is simple: coins were easy to identify as an accepted certified weight. You could trust the coins were all the same basic weight/value because the government had produced the coins. When many coins of the same metal were exchanged they were often weighed, as opposed to counted. This is why it didn't matter if coins of the same denominations were slightly different weights. Several different denominations of the same metal were thrown on a scale and weighed and the value was determined I spite of their "face value" from the mint. 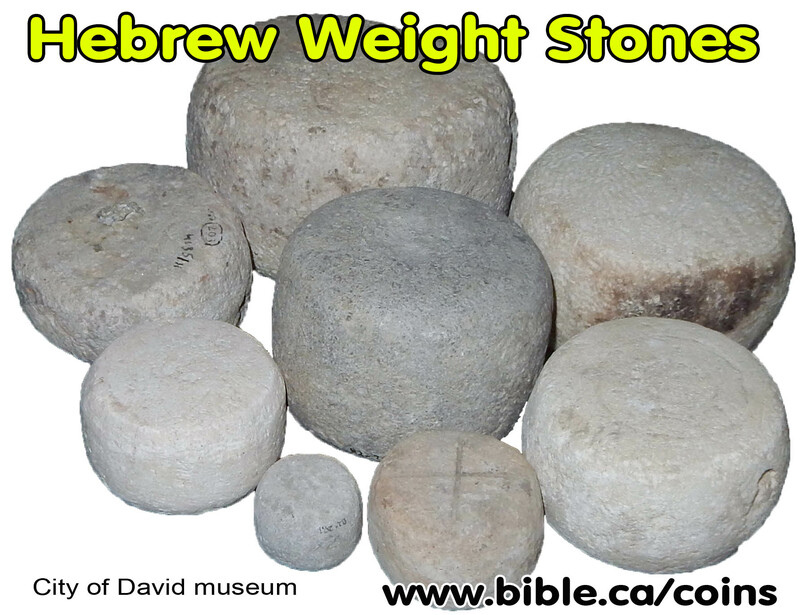 King Darius produced large stones (seen below) with his royal/official inscriptions on them to certify that the stone was the exact weight for a given measure. Several of these stones, each of a different official weight, are known to exist and several have been excavated through archeology and are in museums today. 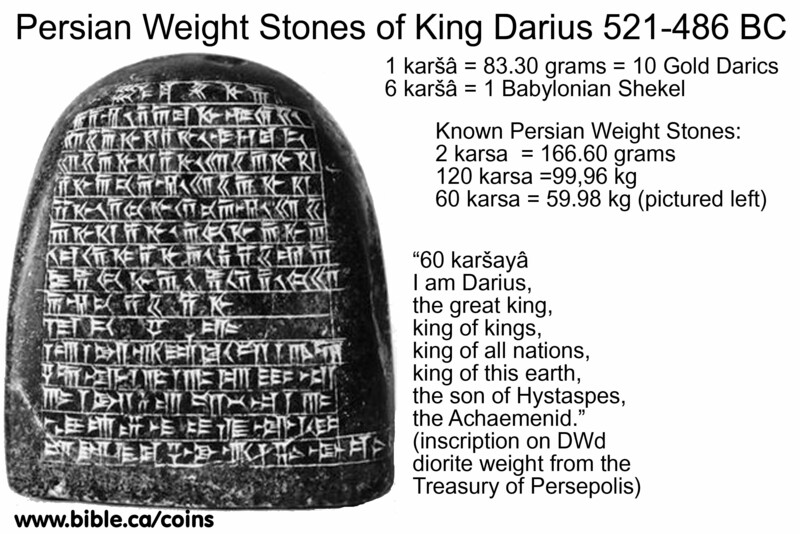 The basic unit of Darius' (521-486BC) weight system was the karšâ (83.30 gram). The karsa was the equivalent of 1/6 of a Babylonian mina. Darius then divided the karšâ into ten shekels of 8.33 grams each, which corresponded to the weight of a gold daric (dareikos) which is mentioned in the Bible during the Persian Empire. 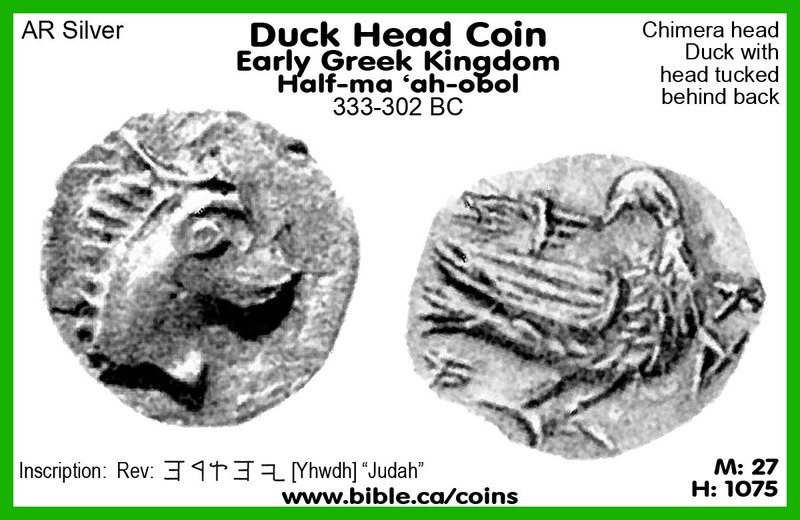 In the photo is a Hebrew coin struck around 320 BC, that imitates the old stone duck weights by featuring a duck with its head tucked behind its back. 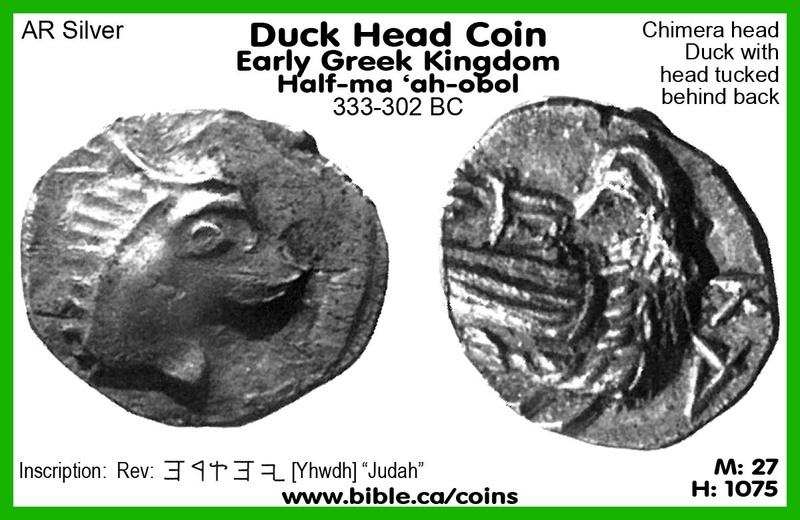 This Hebrew “Duck weight coin” minted during the early Greek Era: 333-302 BC is a half-ma, `ah-obol. 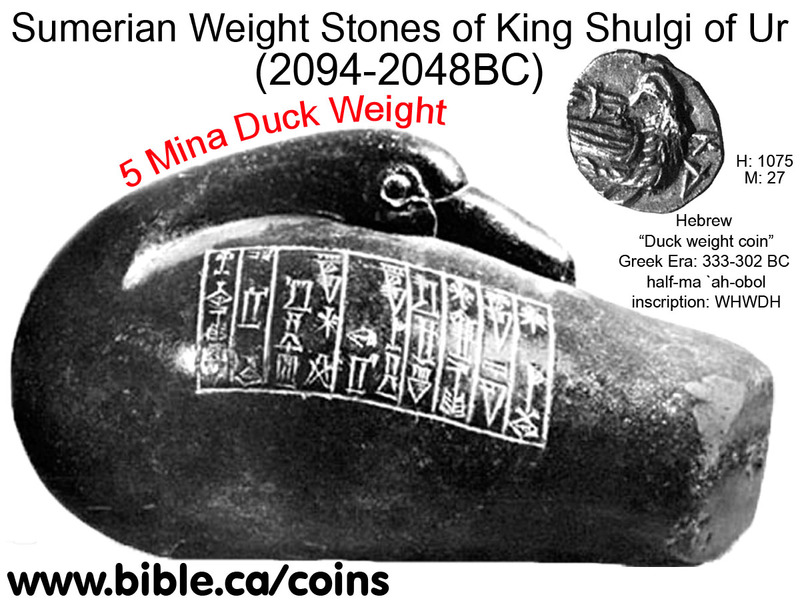 Notice the duck has its head tucked behind its back just like ducks sleep and EXACTLY like the ancient Sumerian duck weight stones! There were hundreds of coins produced during the Ptolemaic era of many varieties. During the earliest years of the empire, Ptolemy II (282-246 BC) for example produced a series of coin denominations in gold, silver and bronze. The same sets of coins were manufactured in up to four different mint cities: Sidon, Ptolemais, "Gaza" Tyre and Alexandria. Below is the series of coins produced at the Gaza "Tyre" mint. Notice the sequence of eagle motifs that progress large to small. This progression in size, weight and logical pictorial diagrams of eagles made the money easy to use and remember their value. Drachm: (72 grams, 42mm) Two Eagles standing wings closed. Tetrobol: (48 grams, 36 mm) One Eagle standing wings open. Diobol: (24 grams, 30mm) One Eagle standing wings closed. Obol: (12 grams, 24mm) One Eagle standing wings open. 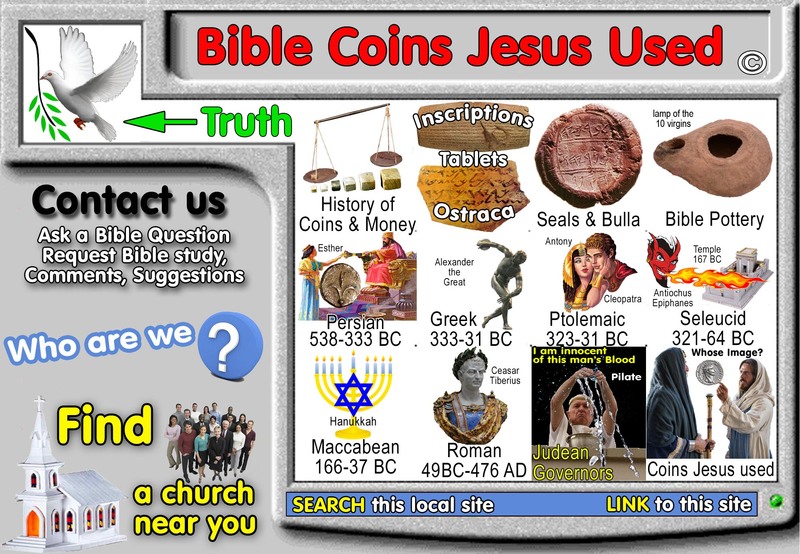 We have created a valuation chart based on the value of coins at the time of Jesus, the apostles and the church. Pounds, Pennies, Farthings, Mites are British units of money that did not exist in the first century. They represent an honest effort by the translators of the KJV to create a relative idea for the reader of the value under discussion. We cannot be certain about the value of each coin or each coins value in relation to each other. 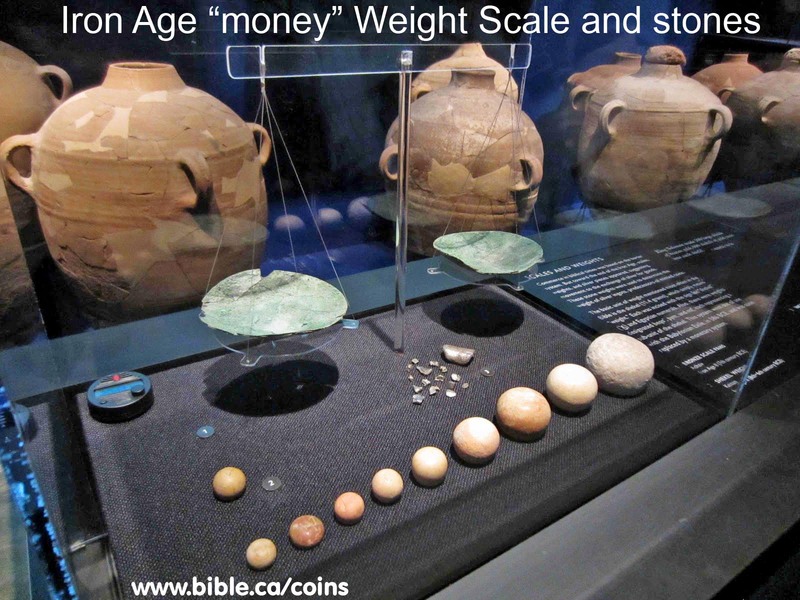 It is important remember that there was considerable variation in the weight of shekels and minas from 2000 BC - 70 AD. This would mean that there are different conversion rates between the various denominations of coins or corresponding weights. Neither the Bible, nor Josephus give us the names of the Jewish bronze coins that were used at the time of Jesus. 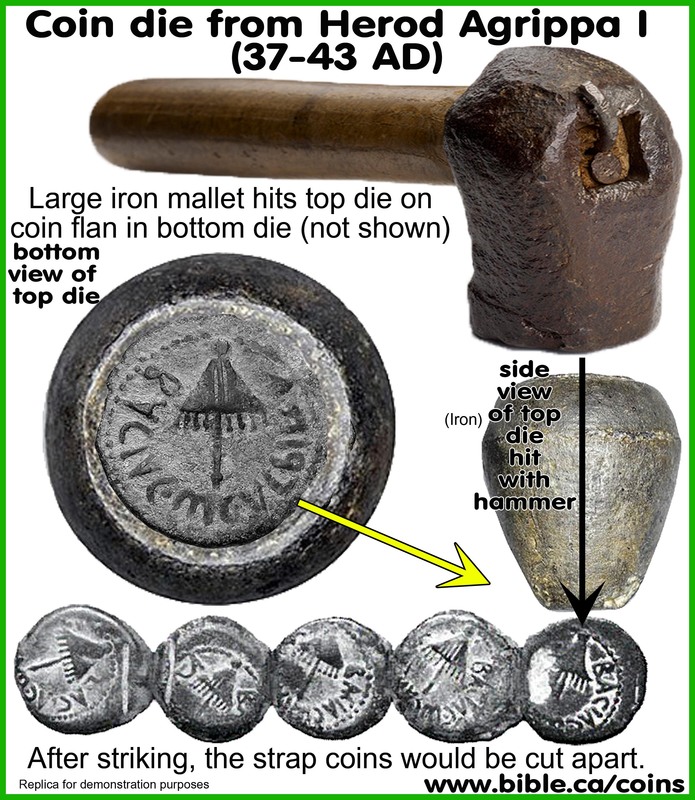 Coins were valued by weight and the inscriptions on each but the weights varied for coins of the same value. The valuation of the prutah, lepton and half-prutah as specific denominations cannot be established by their weights alone, given the variations for all three. Archeological excavations at Khirbet el Maqatir in Israel (Ai of Joshua, Ephraim of Jesus) located 15 km north of Jerusalem have uncovered a first century city and hundreds of coins dating from 300 BC - 70 AD. This scientific information gives us a very good look at the coins Jesus used every day. It is believed the origin of the talent was the weight of a load a man can carry. Temple sanctuary tax for one person. III. Cities where Bible coins were made? 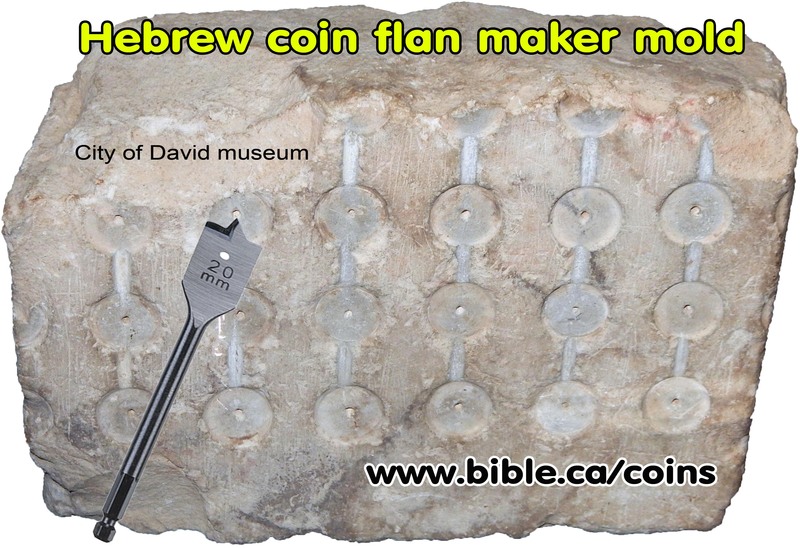 Coin molds are rare and very few have been found in Israel. This one is from Khirbet Rafi, located 33 km SE of Jerusalem near Lachish. Coin molds were made of soft chalkstone. Coins were made from gold, silver and bronze. 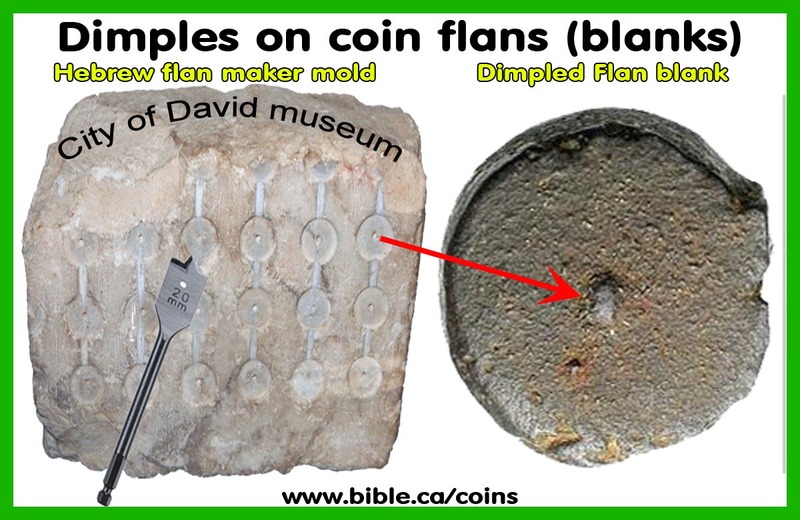 The metals would be heated until molten and then poured into molds to create blank coin flans. The two sides of the mold would be put together. Notice the grooves at the top of each half of the mold. 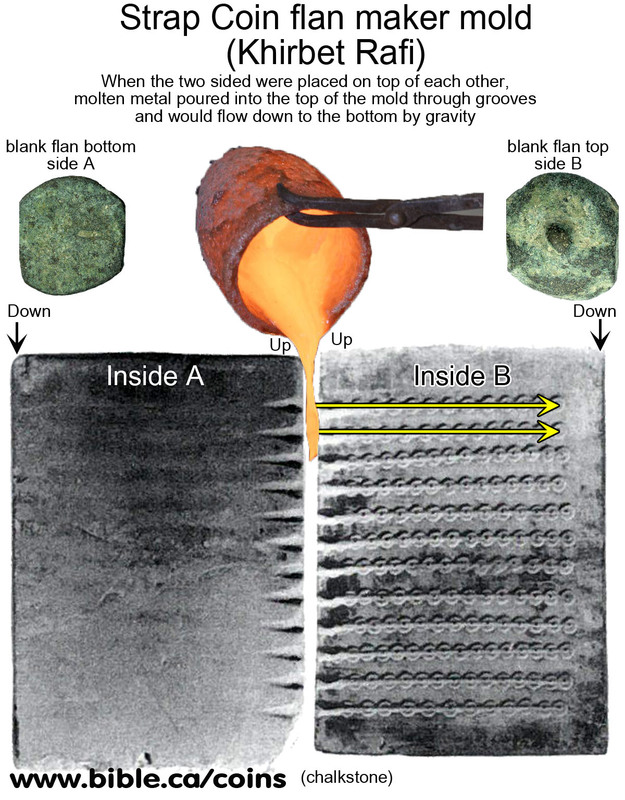 Molten metal is poured in these grooves on the top and the metal would flow by gravity to the bottom. 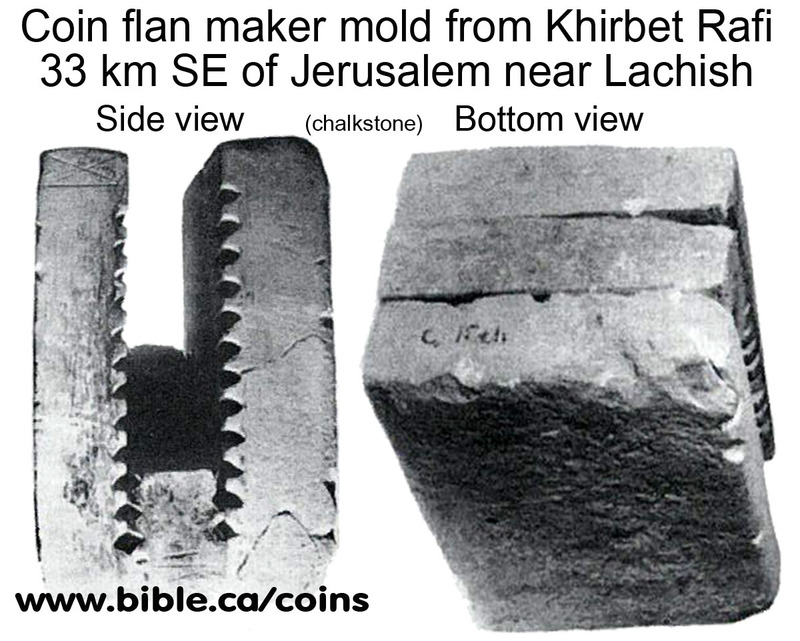 This is a strap coin mold maker from Khirbet Rafi. Once the metal cooled they removed the strips of coin flans. Flan blank dimples: A rotary tool very much like today's modern flat wood drill bit, was used to drill out the mold so that the coins could be created. The result was little dimples on the flan blanks. Center punch mark holes: Coins were sometimes planed with a rotary tool that looks much like a flat wood bit. It was used to smooth one or both sides of the flan to remove dross, little ridges and give the flan a bit of a polish. The result was a little hole in the coin where the center tang of the polishing drill anchored itself into the coin. 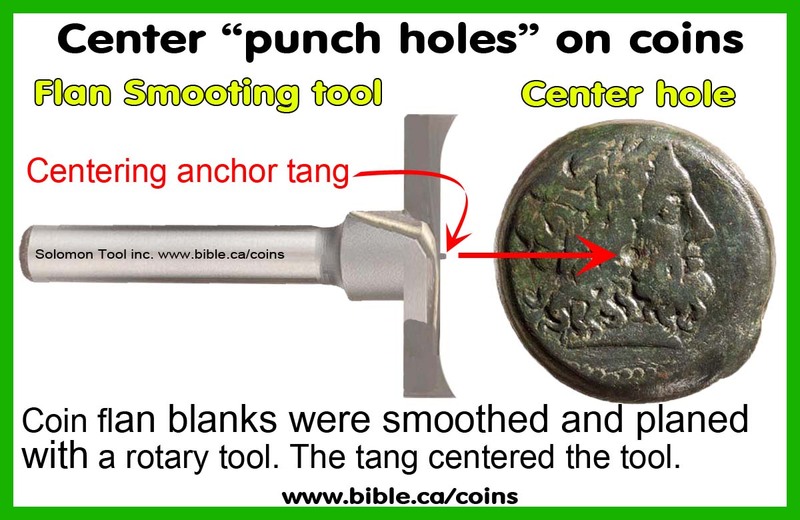 Contrary to first appearance, these "center punch marks" are not made by center punching the coin after they were in circulation. This center hole was on the blank flan before it was hammered in the dies. These holes are common in Seleucid coins, do not detract from their value and are not considered defects. There were a set of two dies made from iron and the blank coin flan would be placed in the bottom die, which was on a large stable rock. They would place the top die on and strike it with a large iron mallet. The coins would then be cut apart and trimmed of excess metal. The basic concept of coins and paper money being equivalent to a specific value of precious metal is 4000 years old. In economics, it is important to be able to trade one good for another, or for a universally accepted standard of value. 1 cow = 5 sheep, etc. 1 cow = specified weight of precious metal. Coins as money did not exist before about 500 BC. Judean coins were first made about 400 BC. During the first century, Jesus used coins that were Roman, Tyre (Phoenician), Roman authorize "Hebrew" and Hasmonean. The Roman coins would be of the Caesars like Tiberius. The Tyre, Phoenician coins would be for the temple taxes. The Roman authorized "Hebrew" coins Jesus used were the Governors of Judea, appointed by Rome like Herod I, Marcus Ambibulous, Valarius Gratus, Pilate, Agrippa I, Agrippa II and Festus. The Hasmonean coins Jesus used were the only coins minted when Judea was independent: John Hycranus I, Aristobulous I, Alexander Janeus, Hycranus II, Aristobulous II and the last of the Maccabeans, Antigonus. 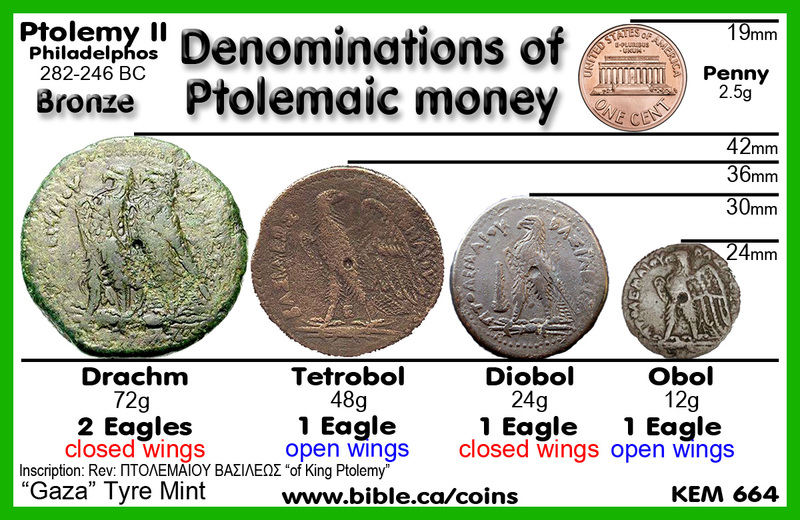 Now that you have a good understanding of the history of money and how coins were made, let's explore the coins used in different periods of Bible history.